For the TV series, see Mullum Malarum (TV series). Mullum Malarum (lit. The Thorn and the Flower [or] Even a Thorn Will Bloom) is a 1978 Indian Tamil-language drama film written and directed by J. Mahendran. Produced by Venu Chettiar and V. Mohan, the film stars Rajinikanth, Sarath Babu, Fatafat Jayalaxmi and Shoba. It marks Mahendran's directorial debut and is based on Uma Chandran's novel of the same name, which serialised in the Tamil magazine Kalki . Mullum Malarum tells the story of Kali, a winch operator who dotes on his sister Valli and clashes with Kumaran, his superior, at a power plant. J. Mahendran, is an Indian filmmaker, screenwriter and actor in the Tamil film industry. Mahendran is regarded as one of the greatest film makers of Tamil cinema and has influenced several filmmakers of the generations followed. Particularly, he has been an inspiration for legendary directors like Mani Ratnam, shankar and he has made great influence in the style and mannerism of super star Rajinikanth. Production was complicated by Chettiar's opposition to cast Rajinikanth as the protagonist because of his dark skin and typecasting as a villain at the time, but Mahendran refused to direct the film without the actor. Since Mahendran had no previous directing experience, cinematographer Balu Mahendra, who was already an established director, assisted him with the screenplay, dialogue, camera angles, casting and editing. The film substantially deviates from the novel, which Mahendran only partly read. Filming lasted for about 30 days, taking place primarily in Sringeri and also in Ooty. The film was edited by D. Vasu, and the soundtrack was composed by Ilaiyaraaja. Balanathan Benjamin Mahendran, commonly known as Balu Mahendra, was an Indian cinematographer, director, screenwriter and film editor who worked predominantly in Tamil cinema. Born into a Sri Lankan Tamil household, he developed a passion for photography and literature at a young age. After witnessing the shoot of David Lean's The Bridge on the River Kwai (1957) during a school trip in Sri Lanka, he was drawn towards filmmaking. He graduated from the London University and started his career as a draughtsman with the Sri Lankan Government. In 1966, he moved to India and gained admission to the Film and Television Institute of India (FTII) to pursue a course in motion picture photography. Upon completion of his diploma, he entered Malayalam cinema as a cinematographer in the early 1970s. Sringeri also called Sri KshetraShringeri is a hill town and Taluk headquarters located in Chikkamagaluru district in the state of Karnataka, It is the site of the first maṭha established by Adi Shankara, Hindu theologian and exponent of the Advaita Vedanta philosophy, in the 8th century CE It is located on the banks of the river Tungā. Mullum Malarum was released on 15 August 1978, India's Independence Day. Although it opened to tepid box-office earnings, positive reviews from critics and favourable word of mouth helped make it a success, with a theatrical run of over 100 days. Rajinikanth's performance as Kali received critical praise, and is widely considered the best performance of his career. The film won the Filmfare Award for Best Film – Tamil, the Tamil Nadu State Film Award for Best Film and Rajinikanth won the Tamil Nadu State Film Award Special Prize for his performance. Mullum Malarum, a breakthrough for Rajinikanth as an actor and a milestone of Tamil cinema, focused prominently on visuals without excessive melodrama and other Tamil cinema conventions that Mahendran disliked. The film's success inspired remakes in 1979 ( Venalil Oru Mazha in Malayalam) and 1985 ( Pyari Behna in Hindi). It was also dubbed in Telugu as Mullu Puvvu, and released in 1979. Malayalam is a Dravidian language spoken in the Indian state of Kerala and the union territories of Lakshadweep and Puducherry (Mahé) by the Malayali people, and it is one of 22 scheduled languages of India. Malayalam has official language status in the state of Kerala and in the union territories of Lakshadweep and Puducherry (Mahé) and is spoken by 38 million people worldwide. Malayalam is also spoken by linguistic minorities in the neighbouring states; with significant number of speakers in the Nilgiris, Kanyakumari, and Coimbatore districts of Tamil Nadu, and Kodagu and Dakshina Kannada districts of Karnataka. Due to Malayali expatriates in the Persian Gulf, the language is also widely spoken in Gulf countries. Pyari Behna is a 1985 Hindi-language Indian drama film directed by Bapu, starring Mithun Chakraborty, Padmini Kolhapure, Vinod Mehra, Tanvi Azmi and Shakti Kapoor. The film is a remake of the 1978 Tamil film Mullum Malarum. Kali is a winch operator at a village power plant. Although notorious for his escapades and self-aggrandising ways, he also does good deeds for the local community. Kali and his younger sister Valli, to whom he is devoted, were orphaned during childhood and have no close family. When a poor wanderer, Manga, and her aged mother arrive in the village, Valli helps them set up a home. Although Manga develops a liking for Kali, he is repelled by her fondness for food. A winch is a mechanical device that is used to pull in or let out or otherwise adjust the tension of a rope or wire rope. In its simplest form, it consists of a spool attached to a hand crank. Winches are the basis of such machines as tow trucks, steam shovels and elevators. More complex designs have gear assemblies and can be powered by electric, hydraulic, pneumatic or internal combustion drives. It might include a solenoid brake and/or a mechanical brake or ratchet and pawl which prevents it unwinding unless the pawl is retracted. The power plant's new supervising engineer is Kumaran, an austere-but-fair boss. His relationship with Kali is difficult, worsening after he sees Kali's unruly side in a series of incidents (including allowing people to ride the winch, in violation of power-plant rules). Kali calls Kumaran "Law Point" because of his strict adherence to the rules. One day, when Kali is on duty, Manga teases him; he abandons the winch and chases her. In his absence, an emergency arises at the plant. The following day, Kumaran suspends Kali from his job for negligence of duty, ignoring his protests and threats. Kali gets drunk and passes out in the road; a lorry runs over his left arm, which is later amputated. He cannot do his job with only one arm, and is fired. Unemployed, Kali directs his anger and frustration at Kumaran, and Manga feels guilty because she is responsible for Kali's plight. At Valli's request, she marries Kali and takes care of him. A truck or lorry is a motor vehicle designed to transport cargo. Trucks vary greatly in size, power, and configuration; smaller varieties may be mechanically similar to some automobiles. Commercial trucks can be very large and powerful, and may be configured to mount specialized equipment, such as in the case of fire trucks, concrete mixers, and suction excavators. Kumaran is attracted to Valli, and asks Kali for permission to marry her. Because he hates his former boss, Kali arranges for Valli to marry Murugesa, a philandering grocer. Although Manga opposes Kali's decision, he stubbornly refuses her plea to let his sister marry Kumaran. She decides to arrange Valli's marriage with Kumaran without Kali's consent. On the day Murugesa is supposed to marry Valli at his house, Kali learns that the entire village has left to attend Valli's marriage to Kumaran. He intercepts Valli's group, reminding her that he loves her and how difficult it would be to live without her. Although everyone else ignores him, Valli runs to him and assures him that she would never abandon him. Relieved that Valli still respects him, Kali then tells Kumaran that although he still dislikes his former boss, he and Valli have his permission to marry. When you watch a film, you know the way the shot was taken or the way the narrative was constructed. [Mahendran's] Mullum Malarum, for instance, was so startlingly different from anything that had come before in Tamil cinema. It really stood out. ... There was something really special about the direction, Balu Mahendra's cinematography, the characterizations, the costumes, the compositions, the colours, the light, the way it was cut and, of course, the music. Shivaji Rao Gaekwad, known by his mononymous stage name Rajinikanth, is an Indian film actor and politician who works primarily in Tamil cinema. He began acting in plays while working in the Bangalore Transport Service as a bus conductor. In 1973, he joined the Madras Film Institute to pursue a diploma in acting. Following his debut in K. Balachander's Tamil drama Apoorva Raagangal (1975), his acting career commenced with a brief phase of portraying antagonistic characters in Tamil films. Apoorva Raagangal is a 1975 Indian Tamil-language drama film directed by K. Balachander. The film features Kamal Haasan and Srividya in lead roles while Rajinikanth, Jayasudha, Nagesh, and Major Sundarrajan play supporting roles. The film was produced by V. Govindarajan and J. Duraisamy under the production banner Kalakendra Films. The soundtrack and score were composed by M. S. Viswanathan while the lyrics for all tracks were written by Kannadasan. Thalapathi is a 1991 Indian Tamil-language crime drama film written and directed by Mani Ratnam, and produced by G. Venkateswaran. It stars Rajinikanth, Mammootty and Shobana in the lead roles, with Arvind Swamy, Srividya, Amrish Puri, Bhanupriya, Nagesh, and Charuhasan playing supporting ones. The theme is based on the friendship between Karna and Duryodhana of the Hindu epic, Mahabharata. The score and soundtrack of the film was composed by Ilaiyaraaja. The film, which features the last collaboration of Mani Ratnam and Ilaiyaraaja, was dubbed and released in Telugu and in Hindi as Dalapathi. The film emerged as a critical and commercial success during its theatrical run. It was later remade in Kannada as Annavru. 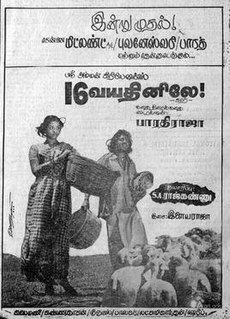 16 Vayathinile is a 1977 Indian Tamil-language romantic drama film written and directed by P. Bharathiraja in his directorial debut. The film features Kamal Haasan, Sridevi, and Rajinikanth in the lead roles, with Ganthimathi, Sathyajith and Goundamani in supporting roles. The film focuses on the strengths and vulnerabilities of Mayil (Sridevi), a 16-year-old schoolgirl, and the challenges she faces and overcomes. Moondram Pirai is a 1982 Indian Tamil-language romantic drama film written, directed and filmed by Balu Mahendra. The film features Kamal Haasan and Sridevi in the lead roles, while Silk Smitha, Poornam Vishwanathan and Y. G. Mahendra play supporting roles. The music for the film was composed by Ilaiyaraaja, with lyrics written by Kannadasan, Vairamuthu and Gangai Amaran. It also featured the last song written by Kannadasan to be recorded before his death in 1981. Mohan Rao, known mononymously as Mohan or Mike Mohan is an Indian film actor, known for his works predominantly in Tamil cinema, and a few Kannada, Telugu and Malayalam films. He is also known as "Kokila Mohan" after his debut film Kokila, and "Mike" from numerous roles playing singers using microphones. In 1982, he received the Filmfare Award for Best Tamil Actor for his work in Payanangal Mudivathillai. AVM Productions was an Indian film production studio. It is the final oldest survived studio in India. The filming studios are located in Vadapalani, Chennai. It has produced over 170 films in Tamil, Telugu, Kannada, Malayalam and Hindi cinema. AVM has introduced numerous actors in Southern industries, some of the prominent actors are Vyjayanthimala, Sivaji Ganesan, Rajkumar, S. S. Rajendran and Kamal Haasan. The AVM Studios besides the shooting floors, has recording, dubbing and a preview theatre. The complex also houses facilities for production and post production processing. Sri Raghavendrar is a 1985 Tamil devotional-biographical film directed by S. P. Muthuraman and was produced by Kavithalaya Productions. The film stars Rajinikanth, portraying the title character, in the lead. Lakshmi, Vishnuvardhan, Delhi Ganesh and Nizhalgal Ravi play prominent roles. The film is based on the life of Hindu saint Raghavendra Swami. The soundtrack was composed by Ilaiyaraaja and lyrics were written by Vaali. The dialogues for the film were written by A. L. Narayanan. Avargal is a 1977 Tamil-language romance film made by K. Balachander starring Sujatha, Kamal Haasan and Rajinikanth. The film had a reputation of being one of the most sensitive movies on women's lib. A triangular love story, it revolves around a woman who is caught between the man she fell in love with and her former sadistic husband who is supposedly reformed and wants to rejoin her. Bhuvana Oru Kelvi Kuri is a 1977 Indian Tamil-language drama film directed by S. P. Muthuraman and written by Panchu Arunachalam. It is based on the novel of the same name by Maharishi. The film stars Sivakumar, Rajinikanth and Sumithra in the lead roles. It focuses on two friends with conflicting characters and their conflicting lives. Pokkiri Raja is a 1982 Indian Tamil-language action comedy film directed by S. P. Muthuraman. It is a remake of the Telugu film Chuttalunnaru Jagratha (1980). The film stars Rajinikanth, Sridevi and Raadhika. The film was a super hit and ran for 175 days in theaters. This film was remade in Hindi as Mawaali and in Kannada as Bazar Bheema(1987). Rajinikanth is an Indian actor who has appeared in over 160 films, predominantly in Tamil cinema. He began his film career by playing antagonistic and supporting roles before graduating to a lead actor. After starring in numerous commercially successful films throughout the 1980s and 1990s, he has continued to hold a matinée idol status in the popular culture of Tamil Nadu. Writing for Slate, Grady Hendrix called him the "biggest movie star you've probably never heard of." Rajinikanth has also worked in other Indian film industries such as Bollywood, Telugu, Kannada, Malayalam and Bengali. Azhiyadha Kolangal is a 1979 Indian Tamil-language coming-of-age film directed by Balu Mahendra, starring Prathap K. Pothan and Shobha. Kamal Haasan played a guest role in the film. The film was Balu Mahendra's second directorial venture and his first in Tamil. Partly autobiographical, the film dealt with the events that happen during the adolescence of three friends who live in a small village. In addition to directing the film, Balu Mahendra wrote the screenplay and shot the film. The film was released on 7 December 1979. Upon release, Azhiyadha Kolangal received critical acclaim, and was premièred at the "Indian Panorama" of the International Film Festival of India in 1980. Sakalakala Vallavan is a 1982 Indian Tamil-language masala film directed by S. P. Muthuraman. The film stars Kamal Haasan and Ambika in lead roles with Raveendran, Tulasi, Silk Smitha and Y. G. Mahendra portraying supporting roles. The film was produced by M. Saravanan, M. Balasubramanian and M. S. Guhan under the production company AVM Productions. Madurai Veeran is a 1956 Indian Tamil-language action film directed by Dasari Yoganand and written by Kannadasan. Based on the folklore legend turned deity of the same name, it stars M. G. Ramachandran as the eponymous character, with Bhanumathi Ramakrishna and Padmini playing his love interests. T. S. Balaiah, N. S. Krishnan and T. A. Madhuram play supporting roles. Moodu Pani is a 1980 Indian Tamil-language thriller film written, directed and filmed by Balu Mahendra and produced by Raja Cine Arts. Starring Shoba and Pratap K. Pothen in the lead roles, with N. Viswanathan, Ganthimathi, Mohan and Bhanu Chander in supporting roles, it is based on two novels: Idhuvum Oru Viduthalai Thaan (1978) by Rajendra Kumar, and The Collector (1963) by John Fowles. The film tells the story of Chandru (Pothen), who has a strong hatred towards prostitutes and would kill any such woman whom he encounters. He falls in love with Rekha (Shoba) and believes marrying her will end his psychological distress. Ashok Kumar Aggarwal,ISC was an Indian cinematographer who worked mainly in the South Indian film industry. In a career that spanned nearly four decades, he worked in over 125 feature films in Malayalam, Tamil, Telugu and Hindi languages. 1 2 3 Rajadhyaksha & Willemen 1998, p. 437. 1 2 "Indian Panorama 1979" (PDF). International Film Festival of India. 1979. pp. 138–139. Archived from the original (PDF) on 6 January 2017. Retrieved 6 January 2017. ↑ "கல்கி இதழுக்கு வயது, 75!" [The Kalki magazine's age is 75!]. Dinamalar (in Tamil). 30 August 2015. Archived from the original on 30 August 2018. Retrieved 30 August 2018. 1 2 3 4 Mahendra, Balu (21 April 2013). "முள்ளும் மலரும் படத்தில் நான்" [Me in the film Mullum Malarum]. மூன்றாம் பிறை... (in Tamil). Archived from the original on 2 November 2013. Retrieved 19 December 2013. ↑ Sadasivam, T. (28 August 1966). "Twenty-five Years of Kalki". Bhavan's Journal. 13: 53–57. ↑ Selvaraj, N. (12 January 2015). "நாவல் – விருதுகளும் பரிசுகளும்" [Novel – Awards and prizes]. Thinnai (in Tamil). Archived from the original on 11 February 2015. Retrieved 30 August 2018. ↑ Mahendran 2013, p. 106. 1 2 Mahendran 2013, p. 108. 1 2 Jeshi, K. (15 December 2013). "Flashbacks of a director". The Hindu . Archived from the original on 16 December 2013. Retrieved 16 December 2013. ↑ Mahendran 2013, p. 106; Ramachandran 2014, p. 81. ↑ Mahendran 2013, p. 121. ↑ Mahendran 2013, pp. 108–109. ↑ Rajadhyaksha & Willemen 1998, pp. 141, 437. 1 2 3 4 Mahendran, J. (1978). Mullum Malarum (motion picture) (in Tamil). Ananthi Films. Opening credits, from 0:00 to 4:10. ↑ Srinivasan, Sudhir; Mahendran, J. (25 October 2014). "My friend Ashok". The Hindu . Archived from the original on 26 October 2014. Retrieved 26 October 2014. ↑ Warrier, Shobha (25 March 1999). "Alas, realistic movies are dead". Rediff.com . Archived from the original on 14 March 2003. Retrieved 4 July 2015. 1 2 3 "It was Kamal, who introduced Balu Mahendra to me: Mahendran". Sify . 19 April 2016. Archived from the original on 20 April 2016. Retrieved 20 April 2016. ↑ "Balu Mahendra was also a literary figure". Ceylon Today . 17 February 2014. Archived from the original on 24 April 2014. Retrieved 24 April 2014. 1 2 3 4 Venkadesan, S. (12 December 2012). "He could have missed out on his favourite film". The New Indian Express . Archived from the original on 9 December 2015. Retrieved 24 November 2013. ↑ Mahendran 2013, pp. 111–112. 1 2 Sreekanth 2008, p. 324. ↑ "ரஜினி, கமலுடன் லதா நடித்த படங்கள்" [The films in which Latha acted with Rajini and Kamal]. Maalai Malar (in Tamil). 26 June 2013. Archived from the original on 17 November 2015. Retrieved 15 December 2013. ↑ Vamanan (22 July 2015). "Raising laughs with those bubbly sounds". The Times of India . Archived from the original on 26 July 2015. Retrieved 26 July 2015. 1 2 3 The Hindu 2012, p. 68. ↑ "'உயிரே போனாலும் பிரச்சாரத்துக்குப் போவேன்' – சூளுரைத்த குமரிமுத்து இன்று இல்லை". Ananda Vikatan (in Tamil). 29 February 2016. Archived from the original on 22 April 2016. Retrieved 22 April 2016. ↑ Rangan 2012, p. 14; Ramachandran 2014, p. 82. ↑ Ramnarayan, Gowri (12 April 2002). "Cannes is not my goal". The Hindu . Archived from the original on 8 September 2003. Retrieved 26 November 2013. ↑ Aravind, C. V. (6 January 2017). "The cinema of J Mahendran: Social milieu was his canvas". The News Minute . Archived from the original on 10 January 2017. Retrieved 10 January 2017. ↑ Mahendran 2013, p. 112. ↑ Mahendran 2013, pp. 113–114. ↑ "Angadi Theru Audio Launch- A simple report!". Ayngaran International . 4 May 2009. Archived from the original on 22 November 2013. Retrieved 23 November 2013. ↑ "கமல் இல்லையென்றால் முள்ளும்மலரும் படம் வந்திருக்காது – இயக்குநர் மகேந்திரன் நெகிழ்ச்சி" [If not for Kamal, Mullum Malarum would not have released – Director Mahendran]. Ananda Vikatan (in Tamil). 18 April 2016. Archived from the original on 20 April 2016. Retrieved 20 April 2016. ↑ Mahendran 2013, pp. 117–118. 1 2 "Mullum Malarum (Tamil)". Central Board of Film Certification. 4 August 1978. Archived from the original on 5 October 2015. Retrieved 5 October 2015. 1 2 Ramachandran 2014, p. 81. ↑ Rangan, Baradwaj (12 December 2017). "Southern Lights: Introducing... Rajinikanth!". Film Companion . Archived from the original on 21 December 2017. Retrieved 21 December 2017. ↑ Mahendran 2013, p. 234. ↑ Rajanayagam 2015, pp. 89–90. ↑ Rajanayagam 2015, p. 79. ↑ Balasubramanian & Ramakrishnan 2012, p. 32. ↑ Thoraval 2000, p. 333. 1 2 Ramachandran 2014, pp. 81–82. ↑ Krishnakumar, Ranjani (24 April 2017). "Tamil Film 'Mannan' Presses the Limits of Using Violence on a Female Nemesis". PopMatters . Archived from the original on 6 May 2017. Retrieved 6 May 2017. J Ramki in his book Rajni: Sapthama? Sagaapthama? writes that Rajnikanth had ruffled a few feathers in the ruling AIADMK since his Mullum Malarum (1978), where he sings ‘raman aandaalum raavanan aadaalum enakkoru kavalai illai [I don’t care if Raman rules the state or Raavanan]'. ↑ "Cinema Vision India". 1 (2–4). 1980: 59. 1 2 3 4 5 Ramachandran 2014, p. 82. ↑ Ilaiyaraaja (1978). Mullum Malarum (liner notes) (in Tamil). EMI Records. 1 2 3 Muralidharan, Kavitha (10 August 2013). "Second coming?". The Hindu . Archived from the original on 14 August 2013. Retrieved 30 November 2013. ↑ Sundararaman 2007, p. 121. ↑ Sundararaman 2007, p. 146. ↑ Sundararaman 2007, p. 157. ↑ Rao, Sudha (15 September 2011). "Music Review: Mankatha". Lokvani.com. New England. Archived from the original on 15 November 2012. Retrieved 23 November 2013. ↑ "மங்காத்தாவில் நடிக்க மிரட்டப்பட்டாரா அஜீத்!". Nakkeeran (in Tamil). Archived from the original on 28 July 2012. Retrieved 22 April 2016. ↑ Mahendran 2013, p. 349. ↑ Karthikeyan, D. (15 July 2011). "Three gems who changed the course of cinema". The Hindu . Archived from the original on 20 September 2015. Retrieved 20 September 2015. ↑ "Mullum Malarum (1978)". Music India Online. Archived from the original on 5 April 2018. Retrieved 5 April 2018. ↑ Ilaiyaraaja (1979). Mullu Puvvu (liner notes) (in Telugu). Vaidyanathan, L. Inreco. ↑ Richard Mahesh, R. (21 August 2009). "Ten things you never knew about Kamal Haasan". The New Indian Express . Archived from the original on 11 December 2013. Retrieved 11 December 2013. ↑ "ஸ்பெஷல் ரிப்போர்ட்: ரஜினிகாந்த் – டாப் 20 திரைப்படங்கள்" [Special Report: Rajinikanth – Top 20 films]. Dinamalar (in Tamil). 12 December 2014. Archived from the original on 11 May 2016. Retrieved 11 May 2016. ↑ Sreekanth 2008, pp. 324–325. 1 2 Sreekanth 2008, p. 325. ↑ Mahendran 2013, pp. 119–120. ↑ Mahendran 2013, p. 120. ↑ Ramachandran 2014, pp. 82–83. ↑ "Rajinikanth in Kathanayakudu". Sify . Archived from the original on 17 December 2013. Retrieved 17 December 2013. ↑ Mahendran, J. (1979). Mullu Puvvu (motion picture) (in Telugu). Ananthi Films. ↑ Mahendran 2013, pp. 347–350. ↑ Mahendran 2013, pp. 136–138. ↑ Rangan 2012, pp. 12–13. ↑ Rangan, Baradwaj (2004). "Two people, one industry". Seminar Publications, New Delhi. Archived from the original on 23 April 2004. Retrieved 4 October 2015. ↑ Mathai, Kamini (16 February 2014). "Gang of Four". The Times of India . Archived from the original on 23 October 2015. Retrieved 23 October 2015. ↑ "திரைக்காவியமாக அமைந்த முள்ளும் மலரும்: தங்கைப் பாசம் மிக்கவராக ரஜினி நடித்தார்". Maalai Malar (in Tamil). 30 October 2012. Archived from the original on 20 December 2013. Retrieved 20 December 2013. ↑ Ashok Kumar, S. R. (3 May 2002). "It's a heavy price to pay". The Hindu . Archived from the original on 14 January 2012. Retrieved 24 November 2013. ↑ Mathevan, Santhosh (15 August 2018). "'Mullum Malarum' stays fresh in mind even after 40 years". The News Today . Archived from the original on 21 August 2018. Retrieved 21 August 2018. ↑ Rangan, Baradwaj (21 October 2005). "Rajini Style". Baradwaj Rangan. Archived from the original on 13 July 2010. Retrieved 4 October 2015. ↑ Karthikeyan, D. (13 December 2009). "A phenomenon called Rajnikanth". The Hindu . Archived from the original on 15 October 2013. Retrieved 1 December 2013. ↑ Lal, Amrith (3 October 2010). "Style is the man". The Times of India . Archived from the original on 20 October 2010. Retrieved 21 October 2015. ↑ "Happy Birthday Rajinikanth". Hindustan Times . Press Trust of India. 12 December 2011. Archived from the original on 18 October 2015. Retrieved 18 October 2015. ↑ Pillai, Sreedhar (13 December 2012). "Rajinikanth is India's biggest one-man entertainment industry". CNN-News18 . Archived from the original on 6 January 2017. Retrieved 6 January 2017. ↑ Bhaskaran, Gautaman (9 December 2014). "Rajinikanth, where is that great actor?". Hindustan Times . Archived from the original on 18 October 2015. Retrieved 18 October 2015. ↑ Muralidharan, Kavitha (16 May 2017). "Why Rajinikanth hasn't taken the plunge: It is not 1996 anymore". The Indian Express . Archived from the original on 9 July 2018. Retrieved 9 July 2018. ↑ The Times of India Directory and Year Book Including Who's who. Bennett Coleman & Co. Ltd. 1984. p. 234. ↑ "Birthday exclusive: Superstar Rajinikanth". Deccan Chronicle . 12 December 2012. slide 24. Archived from the original on 12 December 2014. ↑ Ramachandran 2014, p. 268. ↑ Balamurugan, K. (22 May 2007). "Rajni's Tamil Top 10". Rediff.com . Archived from the original on 25 November 2013. Retrieved 25 November 2013. ↑ "Top 12 Rajinikanth movies – 05". The Times of India . 10 December 2013. Archived from the original on 20 April 2016. Retrieved 10 December 2013. ↑ "Rajini: the actor before the hero". The Hindu . 21 July 2016. Archived from the original on 25 July 2016. Retrieved 25 July 2016. ↑ Saraswathi, S. (27 August 2015). "40 years of Rajinikanth". Rediff.com . Archived from the original on 6 September 2015. Retrieved 21 October 2015. ↑ Bhaskaran, Gautaman (19 July 2016). "Kabali – Will Rajinikanth be an actor all over again". Gulf Times . Archived from the original on 31 December 2016. Retrieved 31 December 2016. ↑ Sreekanth 2008, p. 352. ↑ "Rajinikanth & Kamal Haasan:Who is going to finish it on a high note?". Sify . 27 January 2015. Archived from the original on 27 January 2015. Retrieved 4 July 2015. ↑ Suganth, M. (15 August 2004). "Anjaan isn't a realistic depiction of gangsters' lives". The Times of India . Archived from the original on 17 August 2014. Retrieved 4 July 2015. ↑ Narayan, Anantha (9 May 2014). "Many names of Rajinikanth". Indulge. Indian Express Limited. Archived from the original on 21 August 2014. Retrieved 20 August 2014. ↑ Subhakeerthana, S. (10 January 2019). "Petta review: More celebration, less film". The Indian Express . Archived from the original on 10 January 2019. Retrieved 10 January 2019. ↑ Rangan 2012, p. 108. ↑ Suganth, M. (26 July 2015). "Panchu Arunachalam is the man who invented Rajinikanth as an actor". The Times of India . Archived from the original on 26 July 2015. Retrieved 26 July 2015. ↑ Manoj Kumar, R. (2 March 2018). "Rajinikanth's top 'gangsta' movie dialogues". The Indian Express . Archived from the original on 16 March 2018. Retrieved 16 March 2018. ↑ Manian, Bala (19 July 2016). "The Futility of Decoding Thalaivardom". Arre . Archived from the original on 25 June 2018. Retrieved 25 June 2018. ↑ Rangarajan, Malathi (22 December 2006). "Striking gold, Shankar style". The Hindu . Archived from the original on 3 December 2013. Retrieved 21 March 2014. ↑ "Kathir wants to go the poetic way!". The Times of India . 27 July 2012. Archived from the original on 14 October 2015. Retrieved 14 October 2015. ↑ Balachandran, Logesh (4 October 2015). "Ketta Payyan sir, indha Kabali". The Times of India . Archived from the original on 4 October 2015. Retrieved 4 October 2015. Balasubramanian, P. C.; Ramakrishnan, Ram N. (2012). Grand Brand Rajini. Rupa Publications. ISBN 978-81-291-2059-5. Mahendran, J. (2013) . Cinemavum Naanum[Cinema and Me] (in Tamil). Karpagam Publications. Rajadhyaksha, Ashish; Willemen, Paul (1998) . Encyclopaedia of Indian Cinema (PDF). Oxford University Press. ISBN 978-0-19-563579-9. Rajanayagam, S. (2015). Popular Cinema and Politics in South India: The Films of MGR and Rajinikanth. Routledge. ISBN 978-1-138-82203-0. Rajinikanth 12.12.12: A Birthday Special. The Hindu. 2012. GGKEY:A78L0XB1B0X. Ramachandran, Naman (2014) . Rajinikanth: The Definitive Biography. New Delhi: Penguin Books. ISBN 978-0-14-342111-5. Sreekanth, Gayathri (2008). The Name Is Rajinikanth. Om Books International. ISBN 978-81-87108-44-3. Sundararaman (2007) . Raga Chintamani: A Guide to Carnatic Ragas Through Tamil Film Music (2nd ed.). Chennai: Pichhamal Chintamani. OCLC 295034757. Thoraval, Yves (2000). The cinemas of India. India: Macmillan Publishers. ISBN 978-0-333-93410-4.